Now in its 8th day, DREAM Action has attracted hundreds of supporters who have come to picket, dance, drum, and collect petitions with us to garner the support needed to defend DACA and TPS. NAKASEC also is leading an effort to call on Secretary Elaine Chao, fellow immigrant and Asian American, to join our efforts to defend immigrant rights. We are holding a round-the-clock, 22-day action and vigil until September 5th to support the futures of our young people, like Min Jung and David. 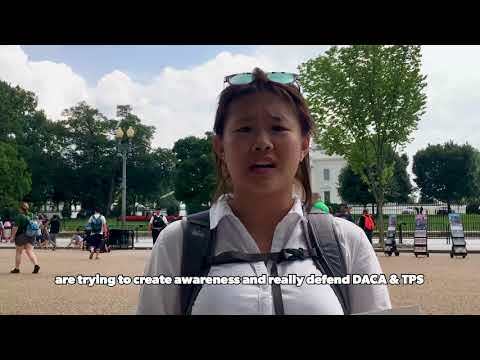 DREAM Action leader Min Jung Park speaks about the importance of DACA. David was born in South Korea in 1985 and came to the United States in 2000. David is undocumented, and has been involved with NAKASEC affiliate KRC. Before President Obama approved the Deferred Action for Childhood Arrivals (DACA) program, things were tough for David, even though he lived in California where he could get a college education. David had a job, but without documentation he couldn’t get a driver’s license, so had to commute by bus between Glendale and Los Angeles for work. Being undocumented, he was also paid less—though the prevailing wage at his job was $10 per hour, David was paid only $7 per hour since he could not officially be on payroll. But after being granted DACA status, David was able to get a license and drive, and then could find a better job. “I am relieved that I can pay taxes on my wages,” he says.